The first set of pictures of this year’s Christmas Caroling events is now online at the Church Flickr account. 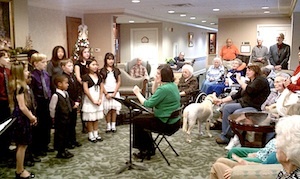 You can view caroling at the Sliverado Senior Center here. These events provided a Christmas program to seniors that would have been unable to leave their environment and attend a program.